Giving back has never been this fun and fulfilling! 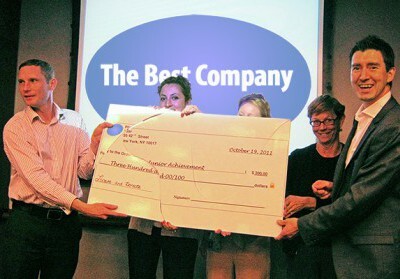 Over the years, BEST has developed a great lineup of charitable give-back programs and have built long-lasting relations with the top philanthropic organizations. 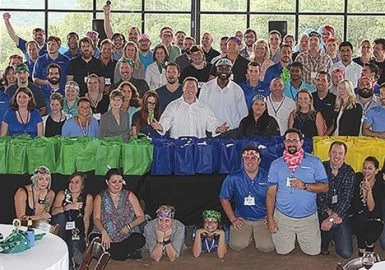 Our CSR programs can be delivered anywhere in North America and feature group bonding activities designed to boost team spirit and unity while helping less fortunate members of your community. These uplifting events include activities, games, and challenges resulting in the creation of items for donation to local and national charities for the benefit of overseas soldiers, schools, the homeless, children, the elderly, and Alzheimer's patients - to name a few. 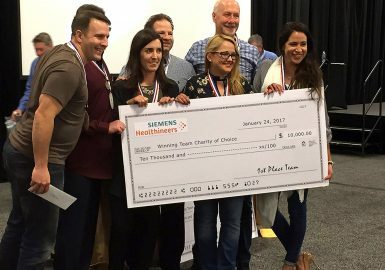 Bears and Blankets is a heartwarming charity event where your teams will build items to comfort younger children in distress. The program also includes fun icebreakers, iPad activities, and photo and video challenges. Your teams will stuff and decorate teddy bears and swaddle them in a warm soft blanket. The items will then be distributed to children through various organizations, including crisis centers and law enforcement agencies. This is our signature program. 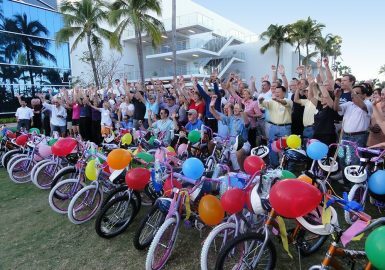 On February 7, 2018, we delivered the largest bike build in history where 3,400 Lowe’s managers built and donated 1,048 bicycles! 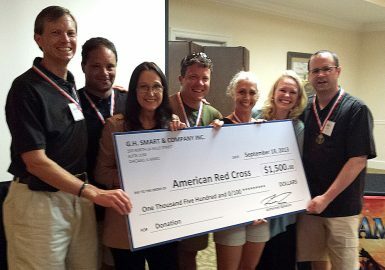 In this worthwhile and highly popular program, fun and charitable giving are combined for an event your group will never forget. Following a kick-off icebreaker, teams will receive iPads loaded with challenges and activities. Teams must complete these to win trips to the bike store where they will find parts to build bikes for deserving kids! We thought it would be fun to reach back and capture the excitement of some old-fashioned fun. After years of delivering successful bike builds, we’ve added a twist - three wheels instead of two! 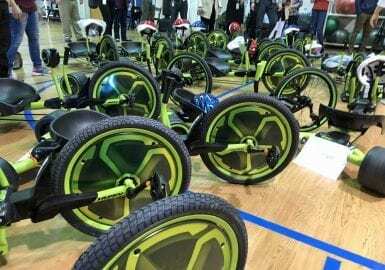 Green Machines are today’s version of a “Big Wheel.” Kids eight and up attending after-school programs will have another fun way to stay active. These beautiful Green Machines will be donated directly to the facilities of organizations who serve children in the local community. Build-a-Guitar® offers corporate groups the opportunity to provide young people with the powerfully positive effect of learning to play a musical instrument. As the name suggests, teams are tasked to build high-quality guitars from custom designed kits. The finished guitars are then donated to teens through schools and other local organizations. 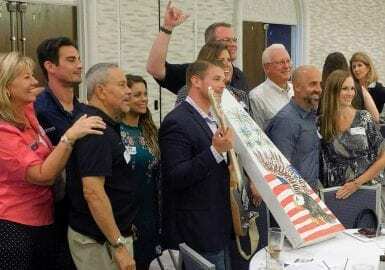 A CSR program that will touch your heart, Build-a-Wheelchair® is a fun, worthwhile event that benefits American veterans and other persons with mobile impairments. Beginning with various iPads® activities to earn the needed materials, teams will then assemble, safety test and decorate new wheelchairs for donation. When possible, a representative from the selected charity will arrive to accept and thank the group for their donations. Your group will bond and have a blast with this program that both entertains and benefits a worthy cause. Teams will face off to answer questions on various topics including History, Pop Culture, Sports and more on a realistic game show set complete with podiums, buzz-in buttons and a large projected answer board. It concludes with a check donation to the charity of your choice. Teams will engage in fun, challenging team building activities leading to the assembly of care packages for a chosen charity. This is an extraordinary way to build team spirit & infuse your group with positive energy and goodwill. Examples of charities include homeless shelters, food banks, hospices, nursing homes and other community and social service agencies. A representative from the charity may surprise your group, speaking passionately about the organization and their mission. 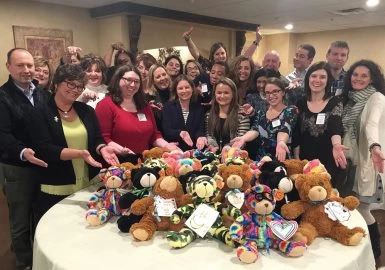 Fostering Hope is a heartwarming team-building program that culminates with the assembly of backpacks for Adoptive and Foster Care children filled with items recommended by networks that distribute care packs to deserving kids. 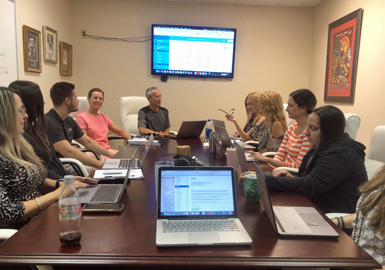 Your group will be issued iPads® to complete tasks, challenges and trivia, including photo and video ops to gain the points needed to purchase the items your team will need to complete their Fostering Hope care packs. Your group will be packing backpacks filled with items for homeless men, women and children. One in 30 children is homeless each year in America, that’s 2.5 million kids. Teams complete a series of fun activities and iPad challenges to earn the points they need to acquire all the items for the backpacks, which may include clothes and blankets, toiletries and hygiene items, first aid supplies, food, school supplies, and toys for children. Kids Rock!™ is a fun CSR charity team building event where teams assemble rocking chairs, rocking horses, and stuffed animals for children while participating in fun icebreakers, iPads® activities and photo/video challenges. 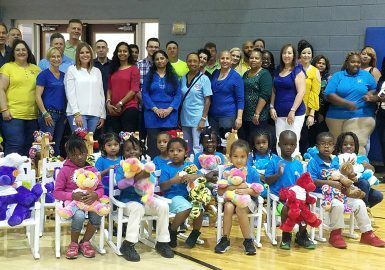 Immediate, tangible results are created and employee morale is boosted through the building and donation of these memorable items for local community centers, hospitals or schools. Locate and Donate SmartHunt® is a high-tech, CSR corporate scavenger hunt in which your group navigates through a customized route to complete text, photo, and video challenges on their iPads to earn points. Along the route, teams will have to find our challenge station where they’ll receive a surprise package, if they can successfully complete their challenge. 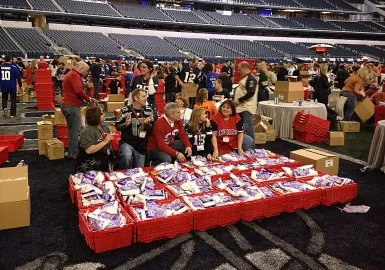 When all the teams’ packages are opened and assembled, the donation is revealed to the group! Mini-Golf Build and Food Donation is a fun charity team building program where your group will design, construct and play a mini golf course using canned and boxed food items. Working in teams, each hole has a special theme and rules, unique to that hole. After the course has been built, an entertaining tournament ensues with scoring and fun competition. Once completed, the course will be deconstructed and the food donated to a predetermined food bank or similar organization. Minute 2 Win It! for Charity will bring out the best in team spirit and a sense of community responsibility from your participants as they compete in tabletop challenges to earn items to create care packages to donate to a local charity. Fast-paced fun, teamwork, and competition are at the heart of every one of these events we deliver. Perfect to include in another corporate or social gathering, or as a stand-alone program. 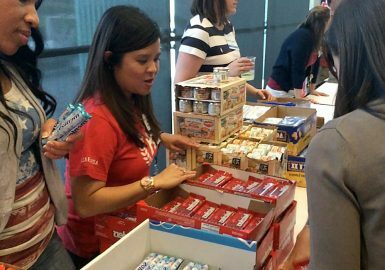 This event will give your group a deep sense of patriotism as it works together to prepare care packages for people currently serving in the military. Teams will first engage in various point-based activities including trivia, puzzles and other problem-solving scenarios delivered on iPads. 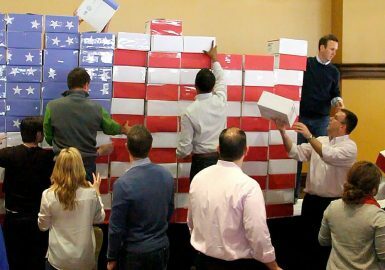 The care packages are then assembled and decorated for donation to service men and women and their families. 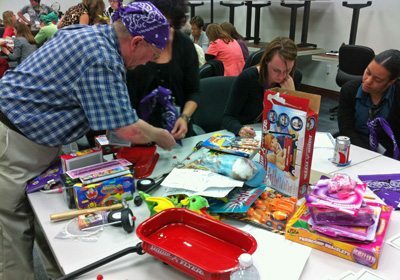 Operation Toy Donation™ is a wonderfully meaningful program designed to benefit disadvantaged children. The program includes fun icebreakers, energizing iPads activities, including photo and video challenges and revolves around the assembling of children’s toys and necessities, which are loaded into toy wagons and colorfully wrapped. It’s the perfect charity team building event if your group wants to make a difference in the lives of children in need! 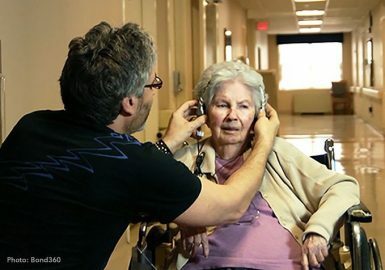 Inspired by the powerful documentary, Alive Inside, this heartwarming program is designed to help those living in nursing homes, particularly those individuals living with Alzheimer’s Disease or other causes of dementia. 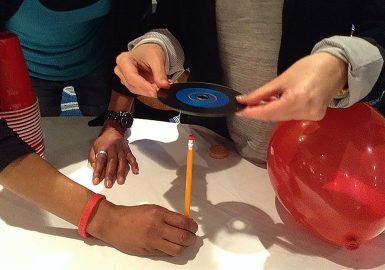 Your group will participate in activities with a music and memory themes, earning MP3 players and other items to donate to the elderly afflicted with this terrible disease. STEM Backpacks for Kids is a heart-warming, charitable, program promoting the importance of education in the fields of Science, Technology, Engineering, and Mathematics. Teams engage in a series of problem-solving initiatives including iPad challenges, MakeDo® Kit construction, and electronic circuitry design to earn items for inclusion in the backpacks. The donation will spark children’s curiosity for learning and experimentation while gaining an understanding of the importance of STEM to their future success. Wagon Build Donation benefits underprivileged preschool age children, providing them with a classic learning tool to boost their coordination, imagination and much more. 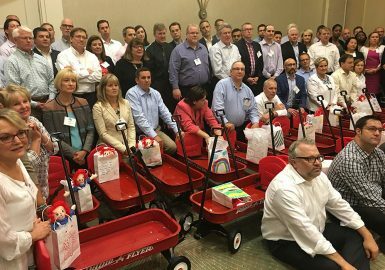 Teams will build full-size, Red Steel Radio Flyer® Ranger Wagons for donation to a local charity, loading each one with a stuffed animal and children’s book. This program will leave your team feeling energized and with a sense of accomplishment, knowing they put smiles on the faces of children in need. We Care for School benefits local schools that are in dire need of supplies, including pencils, paper, glue, paint brushes, first aid kits and more for the classroom, nurse’s office and art room. While participating in fun activities and challenges delivered on iPads, your team will assemble bags full of these items for donation to the local school district. Participants will leave feeling great with the knowledge that they helped support a child’s education. can be enhanced with a charitable element by incorporating a fun and surprising oversized check made out to the charity of your choice, in any amount you choose! Contact Sales for more information.